Parents are often times receptive to menu changes that encourage healthy eating habits; however, when it comes to birthday and holiday celebrations, they can be a little reluctant. As a parent, it’s difficult to allow your child to eat processed and refined foods. However, during celebratory moments, parents do not mind bringing cakes and sweets for the kids to enjoy. 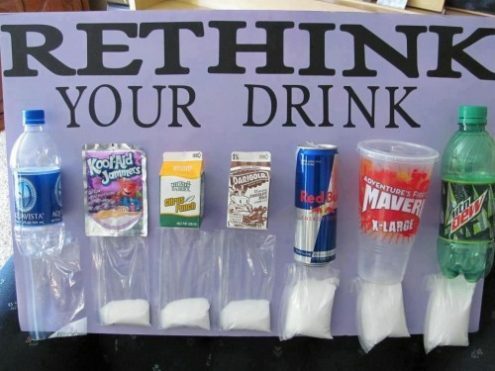 Carol Ware, Director of Our Lady of Lourdes Day Care in Kentucky, started the transition of encouraging healthy habits by exhibiting the sugar display board “Rethink Your Drink” in the foyer as parents walked in. Carol said parents and children were amazed at the amount of sugar in different drinks, which made the elimination of juice in her center successful. Carol received a donation of water bottles and made water available to all children throughout the day. For Valentine’s Day, parents brought in the traditional party treats: cupcakes, chips, candy, juice, etc. Carol decided to use pictures of unhealthy foods and to discourage parents from bringing in these treats. By the next celebration, parents were asked to donate healthy treats that were used to make rainbow fruit skewers. Carol states that the children enjoyed the fruit skewers and the new tradition of healthy celebrations will continue to take place in her center. Program staff at Angeles Mesa YWCA in Los Angeles, California, was concerned with a number of unhealthy practices at their center. Celebrations were filled with sweets, candy and sugar-sweetened beverages. Head Teacher, Colleen Rodriguez, decided to lead the center in change. She began by implementing program policy changes. Schools and after-school programs need to provide consistent messaging around healthy eating to avoid sending youth conflicting messages. While celebrations can include healthy foods, they can also provide opportunities for kids to play and enjoy music, dance, games, sports and other activities.